Everton boss Roberto Martinez expects predecessor David Moyes to get a warm reception in his first visit to the club he left for Manchester United last summer. Martinez inherited the Goodison Park rein to Moyes, fresh from lifting the FA Cup with Wigan Athletic, as the Scotsman left to replace the retiring Sir Alex Ferguson at Old Trafford. Seventh-placed United makes the trip to Merseyside this Sunday. Martinez says Everton fans should recognise the 50-year-old’s achievements in his 11-year stay at the club. 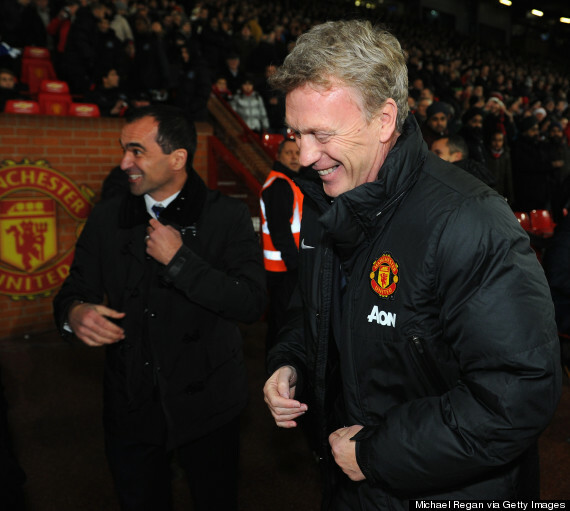 David Moyes and Roberto Martinez Pictured During a Premier League Match at Old Trafford. Moyes guided the ‘Toffees’ to eight top-eight finishes in his ten full seasons as manager, as well as finishing fourth in the 2004/05 season and also reached the 2009 FA Cup final. Martinez’s side are already pushing hard for a Champions League appearance next season and currently sits fifth in the table, a point adrift of Arsenal. But Moyes has endured a difficult first season as United boss- with the Premier League champions set to miss out of Europe’s elite club competition next season. Martinez believes Everton will always want to thank their former manager for his contributions. “We are a club full of integrity and style, so we will show the respect to David Moyes and what he’s done at our football club,” Martinez continued. Victory over United would ensure a first league double over the Red Devils since the 1969-70 season. The LMC Agrees N5.4m Broadcast Deal With Supersport For NPFL. Match-Fixing Could Turn Football into Something like the Wild West- La Liga Head. Ethiopia’s Tadese Breaks Course Record in Paris. Previous articlePHOTOS: Actor Idris Elba Becomes A Father.